Hi guys. I thought I'd share with you what Ive been up to for the last couple of days. 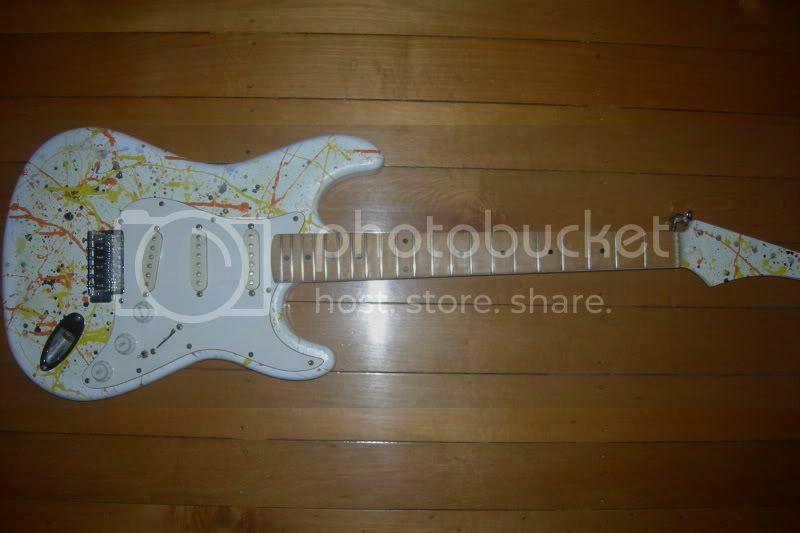 Disclaimer: this is a guitar, although I cannot play and dont intent to. Everything here appliues to bass. 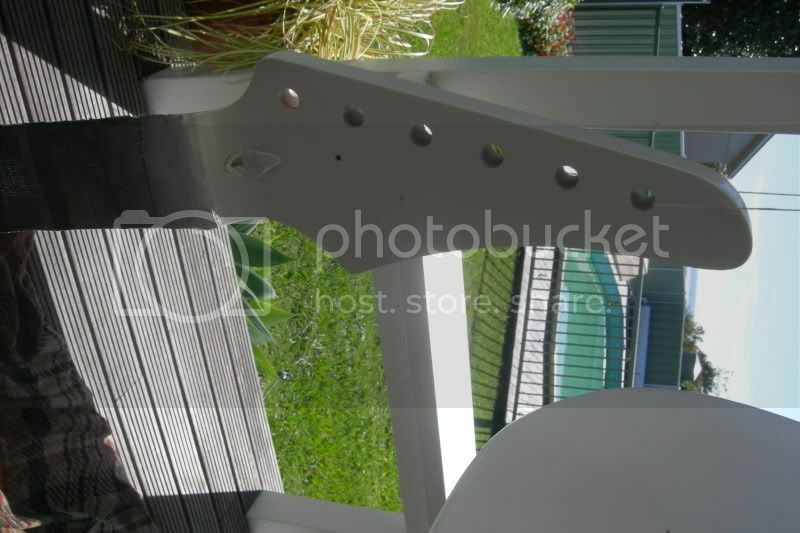 I wanted a new project, and saw this on trademe for just over $100. Then go to mitre 10 and buy a can of spray paint. Whatever color, I used white gloss. Read the instructions on the can and sand properly between coats. No need to sand with the grain, I prefer to sand in little circles. 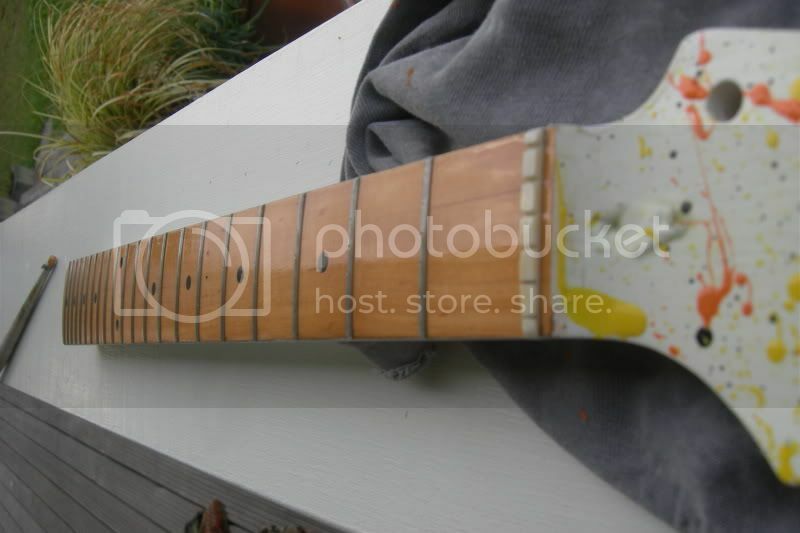 Note the blutack in the truss rod cavity to stop paint getting in. 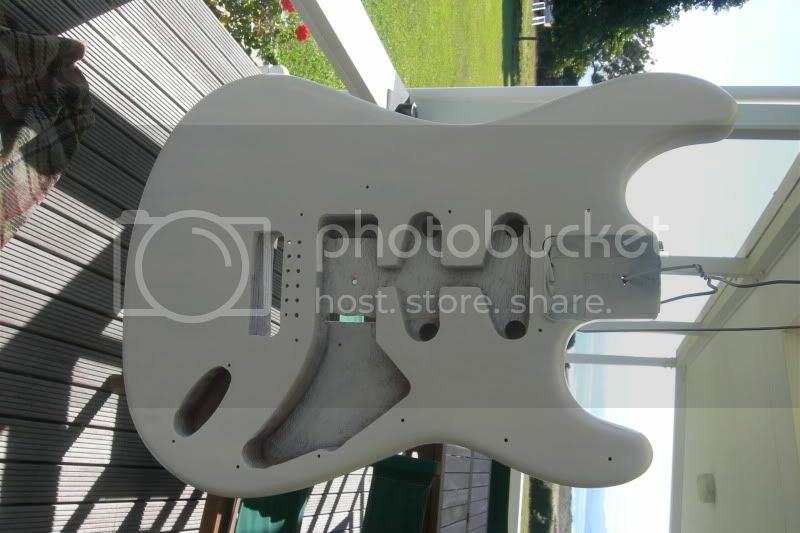 When I get back to Wellington I will be doing the clear coats, fret leveling and full set up. Overall this project took me three days from start to finish in my spare time. 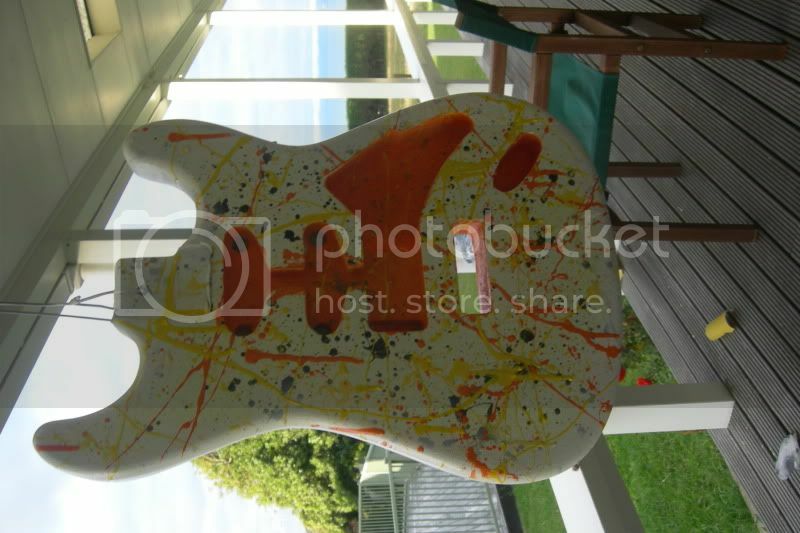 It will be going on trademe as soon as the final coat of clear has dried . I have no use for a guitar. Have a go at it guys-its a lot of fun-worst case scenario is you sand it all off and start again. This project cost just over $50 in paints and sandpaper. Hey that's a brilliant little case study mj. How many basses / guitars have you done? This was my first attempt at paint. And my first guitar. Ive always prefered natural wood finish. Really? Nice job with the pattern. You've got it pretty even. 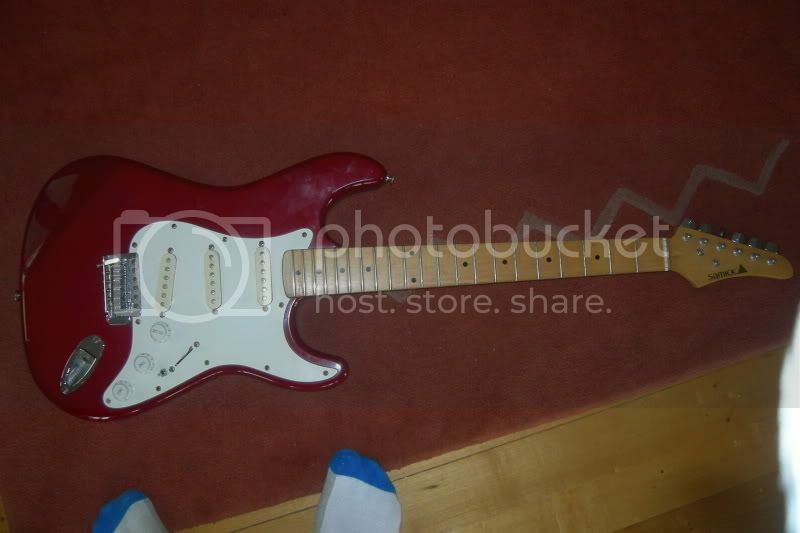 Anyone out there wanna swap this guitar for a project bass? Its finished, everythings working, had a coupla coats of clear. I will get some new pics up once my camera sorts itself out. It needs a good fret leveling and set up. Quite badly actually. Some frets, especially on the low E string are particlarly bad. Playable, but not nice to play. I dont think I mentioned it glows in the dark. 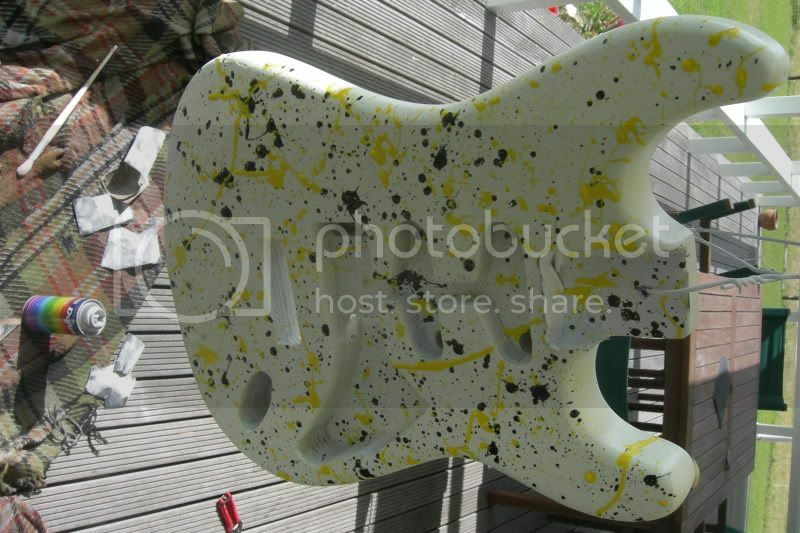 -The bass coat that appears to be white in the photos is actually glow in the dark paint. 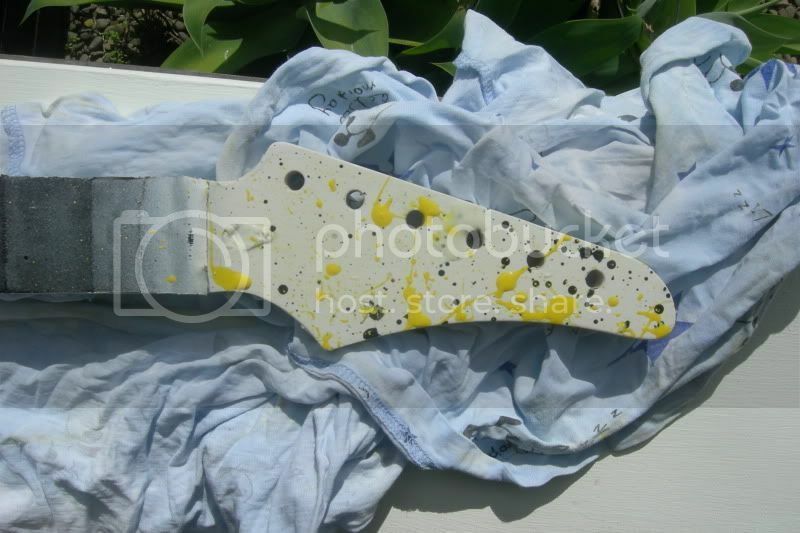 And some of the splatters are glow in the dark also. However, IMO i believe it looks a bit better in these photos than in real life. I dont know why. It has a new set of slinkys on it with less than an hours play. It owes me a few hundred dollars in materials & hardware so if you have anything you think to be worth about that much and wanna swap let me know. 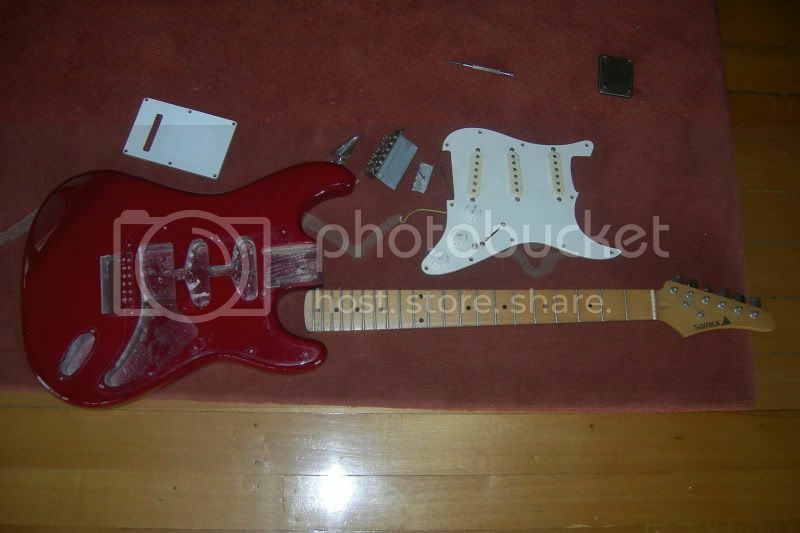 Ideally looking for a P bass squire or failing that another fender ripoff. Any condition. Even parts... Or make an offer.